A floating fence to gather water samples was set up on the James Smith Cree Nation after the Husky oil spill in 2016. 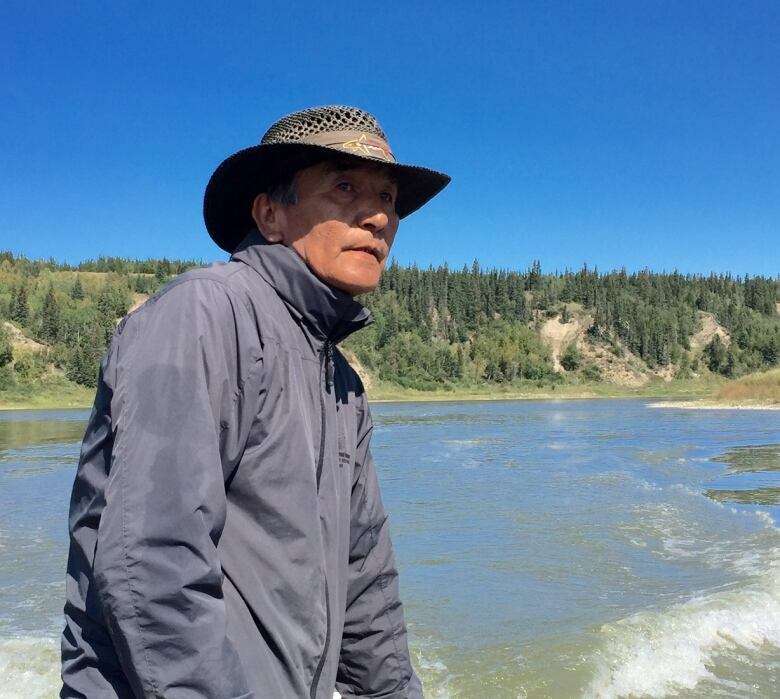 The James Smith Cree Nation and the Cumberland House Cree Nation are seeking reparations from Husky Energy for the spill in July 2016 that polluted the North Saskatchewan River. They cite damage caused by the spill and allege Husky hasn't been willing to work with them to make things right. The James Smith Cree Nation alleges in a prepared statement of facts that Husky was advised to take remediation steps after about 40 per cent of roughly 250,000 litres of oil mixture leaked into the river. The statement, obtained by Prince Albert radio station CKBI, claims Husky "failed or refused to perform remediation steps to mitigate, limit or remove the adverse impact" of the spill. None of the allegations by either First Nation has been proven in court. The spill forced the cities of Prince Albert, North Battleford and Melfort to shut off their water intakes for almost two months. Wildlife was also harmed. James Smith's statement of facts alleges Husky repeatedly failed to provide the community with updates regarding the cleanup, didn't provide updated technical data such as studies or reports or any other information related to the oil spill. related to the spill response. The band is asking for damages to make up for its members' lost ability to hunt, fish, trap, gather and otherwise enjoy the river. It also seeks an order requiring Husky to cover the costs of remediating the water, riverbanks and vegetation. The band, based about 60 kilometres east of Prince Albert, wants out-of-pocket expenses accrued during the oil spill cleanup period covered as well. It is asking for punitive damages, legal costs and interest on any compensation. The Cumberland House Cree Nation, located about 300 kilometres east of Prince Albert, has also filed legal paperwork against Husky Energy. Many of the allegations in its statement of facts mirror those submitted by the James Smith band. The Cumberland House Cree are also seeking a judge's order requiring Husky Energy to "immediately and fully, and at their own expense, remove or remediate oil in the water, soil, vegetation, and debris on the reserve lands." Husky has said that more than 90 per cent of the oil was recovered. The company concluded that the spill which originated near Maidstone, Sask, was caused when ground underneath a submerged section of pipe shifted. As of October 2016, the James Smith Cree Nation had been reimbursed $140,000 toward cleanup efforts. At the time, Husky had spent $90 million in total remediating the spill.